And there it is! The big detail! It’s a large change. It’s very easy to convince yourself that you can feel tiny changes, but you will be fooling yourself. 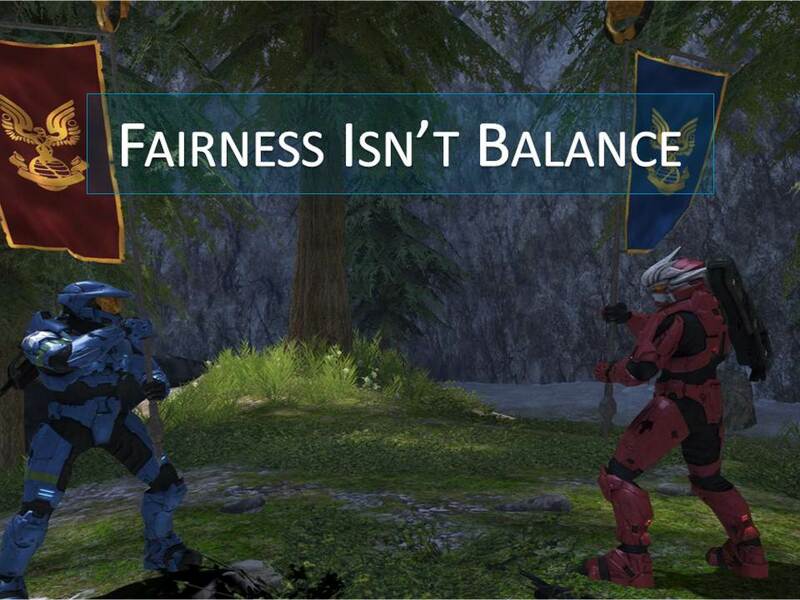 The balance never hinges on a 2% difference in a single value! It was a smaller change than we tried initially. I think originally we changed it to 0.9, which broke the flow and wrecked the weapon, but did fix the problem, so we knew we were on the right track. In general, you want to overshoot and then come back. You have to make sure your change accomplishes your goal, and then dial it back. 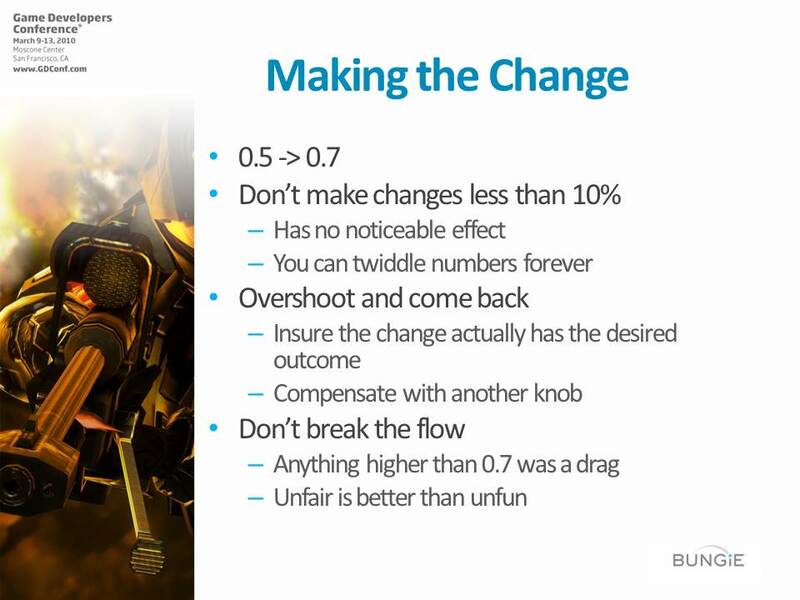 There are lots of ways to verify that a change was successful. 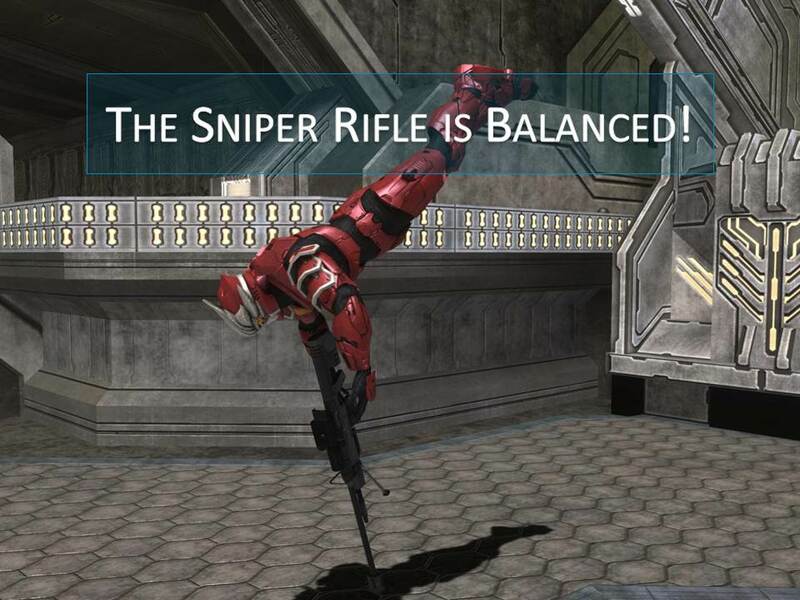 In this case, the Sniper Rifle didn’t get any less popular; People still use it whenever they can get it. But Optimizers stopped using it exclusively. The other reason we could tell it was balanced was because we could compare how the behavior we were seeing in playtests matched the desired role we described in our paper design. It’s not quite an objective test, but it should help. And most importantly, I no longer got nervous when I watched people use the Sniper Rifle. 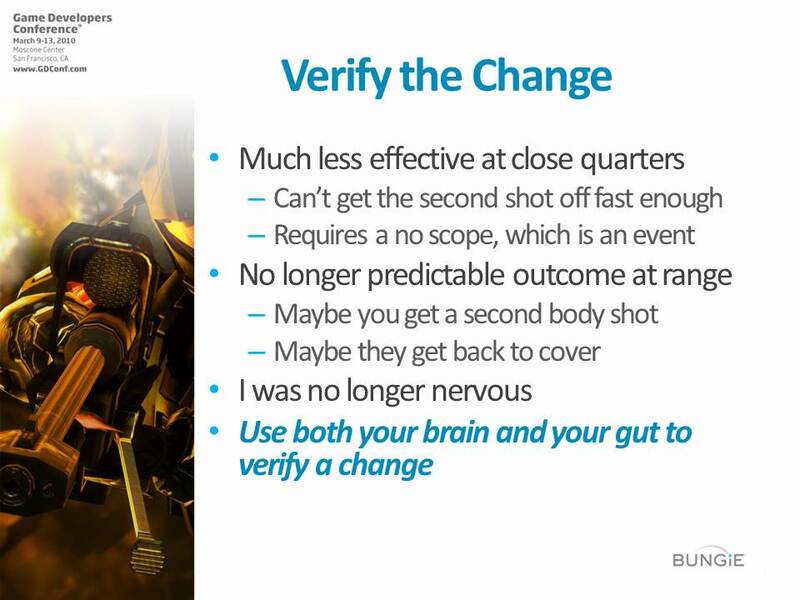 You should verify a change with both your brains and your guts. At this point during my GDC talk, the audience started clapping, cluing me into the fact that I was completely out of time. So I just went with the flow and ended it there, which was fine. 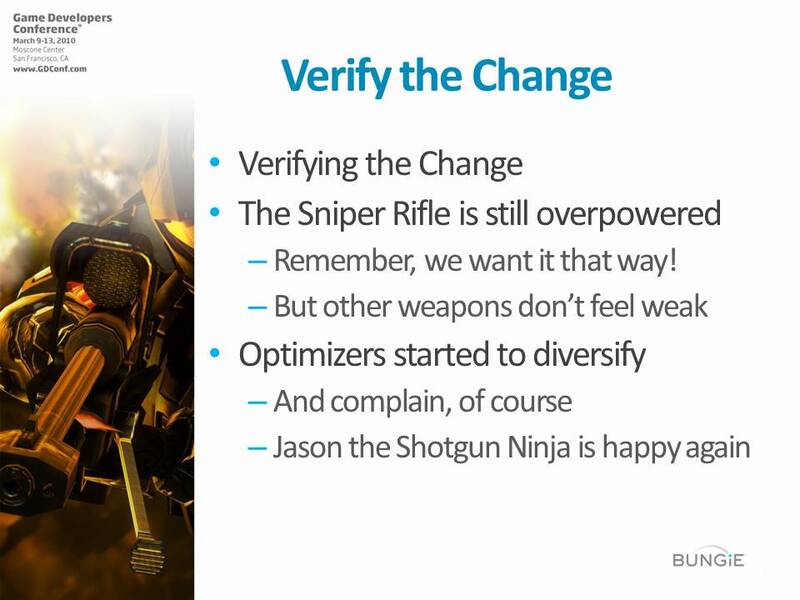 I had walked people through the balancing process, brought up the important principles, and applied them to the sniper rifle change. But I had also intended to mention a couple of things about the last stages of balancing, which I will get into next week! Here’s what we didn’t do. We didn’t touch the Strength Knobs. In most cases, they aren’t the problem anyway. When a weapon is being used as intended, it should feel overpowered. 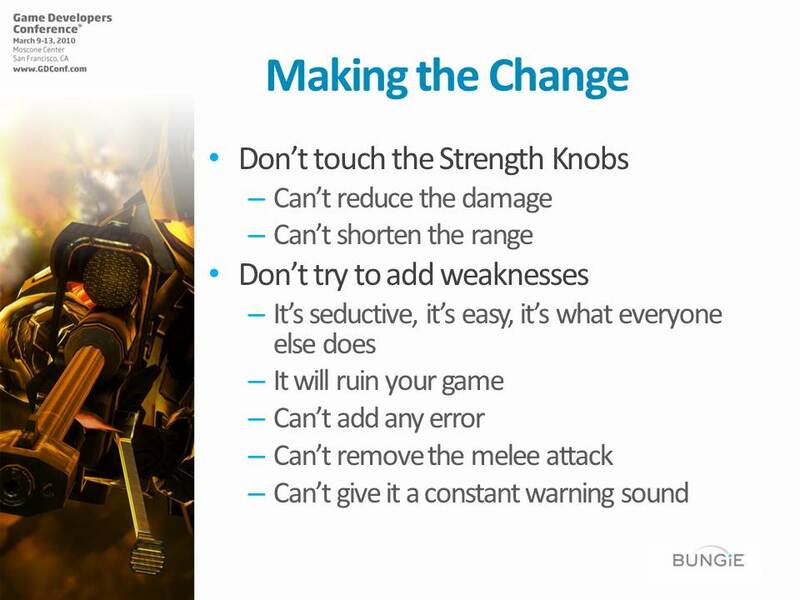 So most imbalances come from using a weapon outside its role, in which case changing the strength knobs won’t fix anything, it will just make the weapon worse. We also didn’t try to add a weaknesses. It often feels like the only option, but find something else! That sort of “a little hot, a little cold” design never ends. You’ll just chase your tail until you run out of time. Your strategy should be to find where the element is being used outside of its designated role, and change the mechanics to constrain it better. But if you can’t touch the Strength Knobs, you have to touch the Flow Knobs. (Remember, there isn’t anything else, because we removed all the extraneous mechanics!) The tricky part is to fine tune those Flow Knobs without losing the flow state you worked so hard to capture. Revisit them in light of what you now know about the game and don’t change them so far that you break flow. 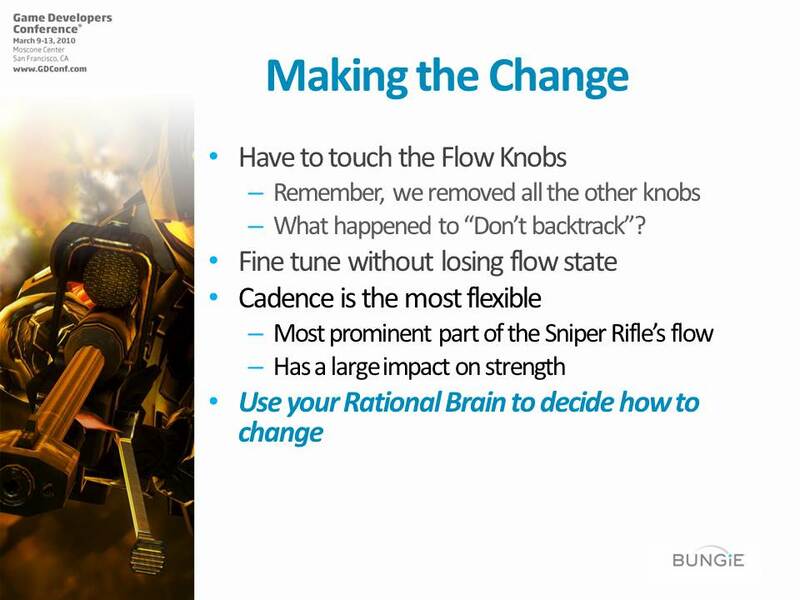 Of the components of flow, cadence is the most flexible, so many problems can be fixed by adjusting cadence. Hopefully not so far that you lose the rhythm. Most importantly, at this point you must not rely on your gut, it will steer you wrong! You need a very clear chain of cause and effect, so you can make as small a change as possible to fix the problem. So what are the possible flow knobs we can tweak? What will achieve the balance objective with the least amount of ripple effect? We could have changed the number of shots in a clip. That would have changed the cadence to cause the player to reload more often. But it would also have meant a sniper couldn’t kill two enemies without reloading unless he got a headshot. That would have ratcheted up the pressure quite a bit, and moved the Sniper Rifle out of the skill range of most players. We could have increased the length of the reload. But dying because you can’t fire back is frustrating. To be honest, this change was a contender, but it felt too much like adding a weakness. We could have changed the time to it took the Sniper Rifle to reach full zoom. We actually tried this as a solution (and found some bugs in the camera code, too!) 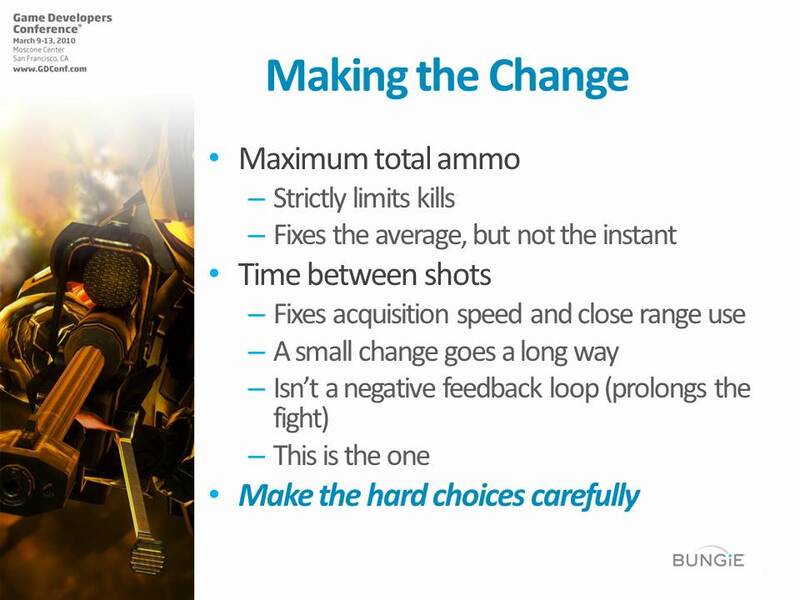 But in the end, it encouraged players to fire without zooming, which broke the role worse than the original issue. In fact, it exasperated the problem of players using the Sniper Rifle at close range. 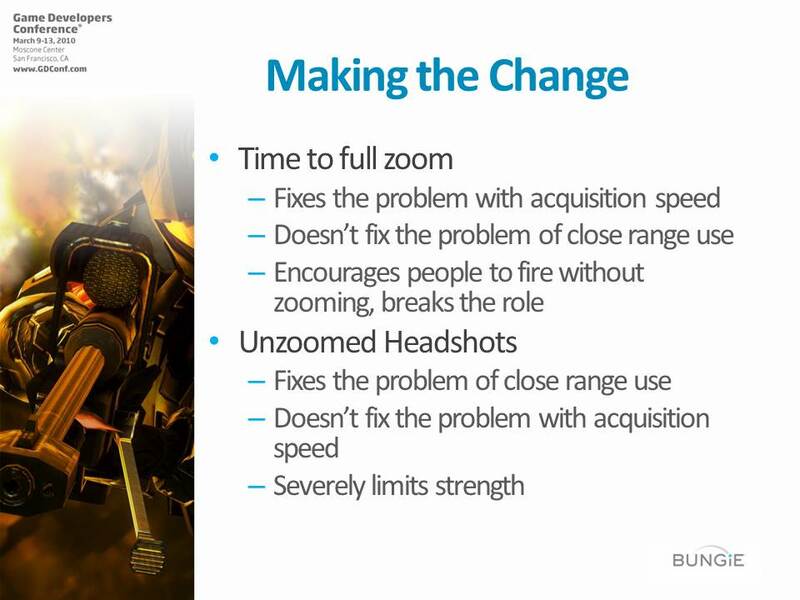 We also could have prevented the Sniper Rifle from doing headshots when unzoomed. Unfortunately, this removes a uniquely cool moment, which even average players can experience if they get lucky. Finally, we could have changed the time between shots. We didn’t choose this option immediately; we tried, tested and reverted almost every value on this list. In the end, increasing the time between shots was the only one that fixed the balance problem with a minimum of side-effects. 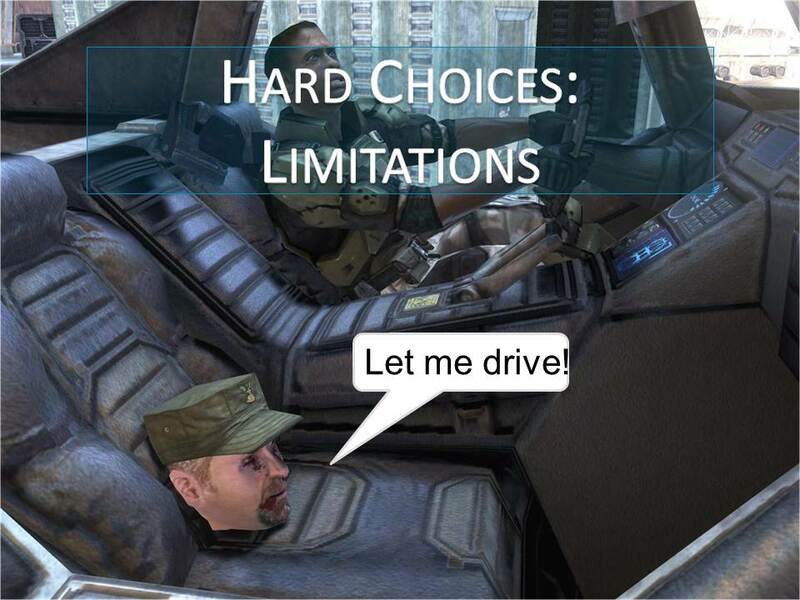 Sometimes you have to let your head drive. I’ve claimed in this talk that your rational brain is a feeble instrument and cannot handle the volume of input associated with balancing a multiplayer game. This is true, but that is not an excuse for presenting your design decisions as inexplicable black magic guided solely by intuition and guesswork. You need to have solid design values that you can point to as a general explanation for how you make decisions, and then provide specific reasons and supporting data when necessary to convince the team. Just because you don’t have time to carefully examine every detail doesn’t mean you can’t logically examine any decision. Other designers and developers have instincts, too; if they clash with yours take it as a sign that you need to look closer. 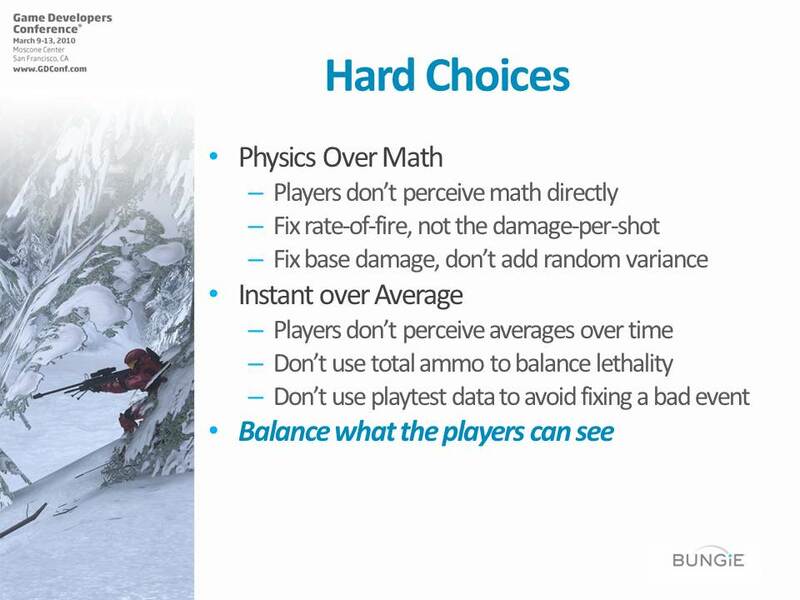 Here are some good design values to use when balancing a complicated game system. First, fix imbalance with physics when you can, and only revert to math when required. 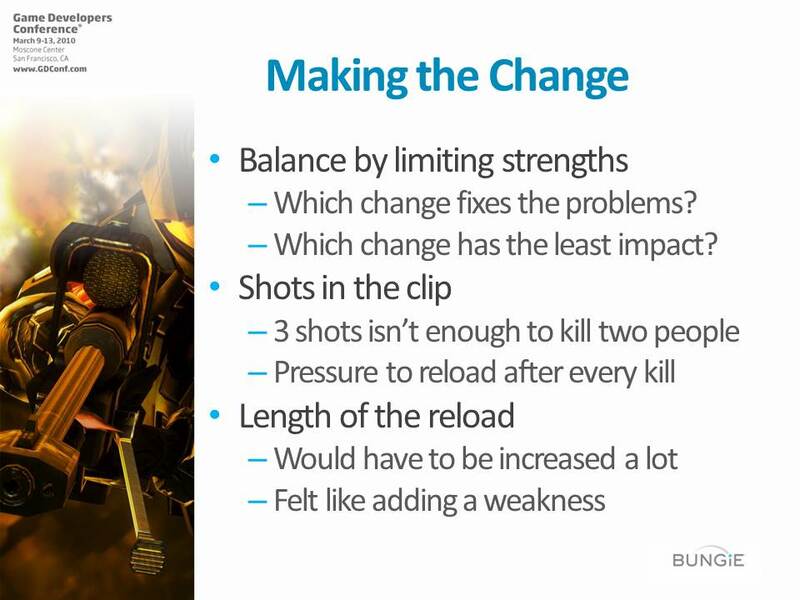 The player cannot directly experience the math behind the system, so tweaking elements by changing mathematical formulas is difficult to perceive, tough to evaluate and even if it does fix the problem in the long-term, it may not feel fixed. Of course, at their most basic level all video games software are math, so it may be impossible to address a problem without making changes to numbers and equations, but don’t resort to that immediately. I think a lot of designers got their start with board games and pen-and-paper RPGs, where the math is explicit, but modern games are simulations and respond more readily to behavioral changes than to statistical ones. Hey look, a totally fair game… A totally boring, pointless, frustrating, fair game. You cannot make a Sniper Rifle fair. The person being sniped cannot counter-attack, faces near-instant death, and usually doesn’t even know they are in a fight until it is too late! 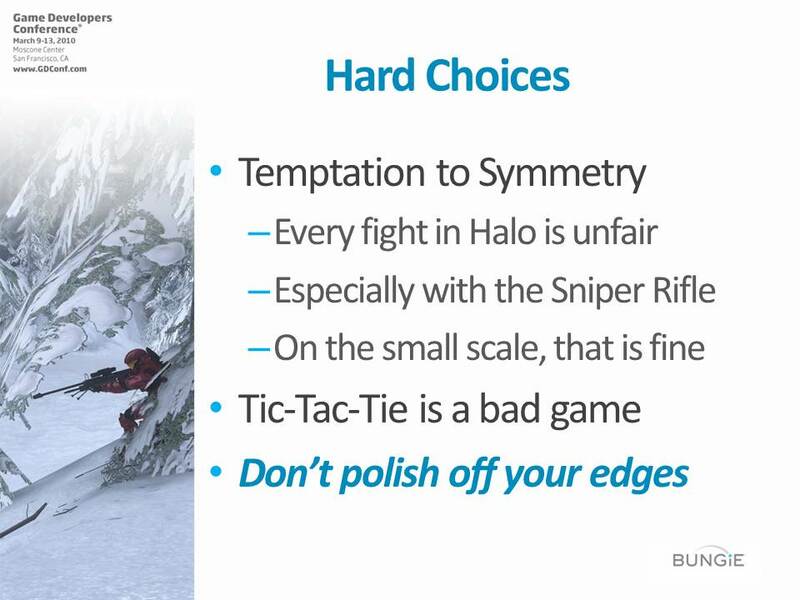 If you make fairness your goal you will end up removing all the interesting asymmetry from the game. Instead, focus on longevity. Create a Sniper Rifle that doesn’t make the person that was sniped want to quit, and you will succeed.